Contact® VBR/IBF System - Products - RTI Surgical Holdings, Inc. The Contact® VBR/IBF system is designed for use in an anterior or anteriolateral approach to the lumbar spine. When used as a lumbar intervertebral body fusion implant, the Interbody Fusion (IBF) / Vertebral Body Replacement (VBR) System (“IBF/VBR System”) is indicated for intervertebral body fusion of the spine in skeletally mature patients. Lumbar IBFs are intended for use at either one level or two contiguous levels in the lumbar spine, from L2 to S1 intervertebral body space, for the treatment of degenerative disc disease (DDD) with up to Grade 1 spondylolisthesis. DDD is defined as back pain of discogenic origin with degeneration of the disc confirmed by history and radiographic studies. Lumbar IBFs are to be used in patients who have had six months of non-operative treatment. IBFs are designed for use with autogenous bone and/or allogenic bone graft comprised of cancellous, and/or corticocancellous bone graft to facilitate fusion. IBFs are intended to be used with supplemental spinal fixation cleared for the implanted level. When used as a lumbar intervertebral body fusion device (Rotate, Bullet-Tip, T-Plus, Contact, CrossFuse, and CrossFuse II), the Interbody Fusion (IBF) / Vertebral Body Replacement (VBR) System (“IBF/VBR System”) is indicated for intervertebral body fusion of the spine in skeletally mature patients. Lumbar IBFs are intended for use at either one level or two contiguous levels in the lumbar spine, from L2 to S1, for the treatment of degenerative disc disease (DDD) with up to Grade 1 spondylolisthesis. DDD is defined as back pain of discogenic origin with degeneration of the disc confirmed by history and radiographic studies. Lumbar IBFs are to be used in patients who have had six months of nonoperative treatment. IBFs are designed for use with autogenous bone graft to facilitate fusion. IBFs are intended to be used with supplemental spinal fixation cleared for the implanted level, such as Quantum, Streamline TL, Contact ALP, Streamline MIS Systems, or Lat-Fuse Lateral Plate System. When used as a vertebral body replacement (VBR) device (C-Plus, Rotate, Bullet-Tip, T-Plus, Contact, CrossFuse, and CrossFuse II), the Interbody Fusion (IBF) / Vertebral Body Replacement (VBR) System (“IBF/VBR System”) is intended for use in the thoracolumbar spine (T1-L5) for partial replacement (i.e., partial vertebrectomy) of a diseased vertebral body resected or excised for the treatment of tumors in order to achieve anterior decompression of the spinal cord and neural tissues, and to restore the height of a collapsed vertebral body. VBRs are also indicated for treating fractures of the thoracic and lumbar spine. VBRs are designed to restore the biomechanical integrity of the anterior, middle and posterior spinal column, even in the absence of fusion for a prolonged period of time. The system must be used with supplemental fixation cleared for the conditions listed above (i.e., tumor or trauma of T1-L5) such as the Streamline TL Spinal Fixation System, Streamline MIS Spinal Fixation System or Quantum Spinal Fixation System. Additionally, the VBR device is intended to be used with bone graft. The components of this device are manufactured from a radiolucent polymer and include either Titanium (Ti) alloy or Tantalum (Ta) radiographic markers. Mixing of implant components with different materials is not recommended, for metallurgical, mechanical and functional reasons. This system has not been evaluated for safety and compatibility in the MR environment. This system has not been tested for heating or migration in the MR environment. The implants of this system are manufactured using non-metallic and metallic, non-ferromagnetic materials, which are not considered to be a contra-indication to MRI scanning; however, due to the presence of metallic material, image artifact will occur and there is a risk of heat generation. Any patient with an implant should therefore be monitored carefully, both in the approach to the magnetic field and during the examination. If discomfort is experienced, MR exposure should be discontinued. The implantation of interbody fusion devices/vertebral body replacements and supplemental internal fixation should be performed only by experienced spinal surgeons with specific training in the use of this system as this is a technically demanding procedure presenting a risk of serious injury to the patient. Preoperative planning and patient anatomy should be considered when selecting implant size and supplemental internal fixation. Interbody fusion devices and vertebral body replacements (regardless of the indication for which they are designated) are designed to withstand full load bearing until bony union of the spinal segment(s) normally occurs. 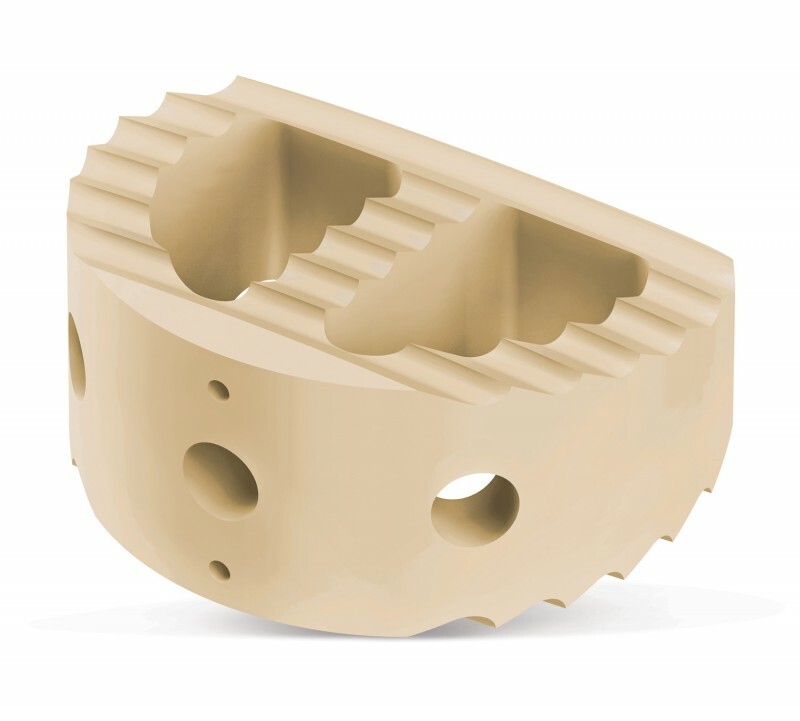 To ensure load-bearing ability supplemental fixation is required with the use of this implant. While proper selection can help minimize risks, the size and shape of human bones present limitations on the size, shape, and strength of implants. Internal fixation devices cannot withstand activity levels equal to those placed on normal healthy bone. These implants can break when subjected to the increased loading associated with delayed union or nonunion. Typically, internal fixation devices are loadsharing devices which hold a fracture in alignment until healing occurs. If healing is delayed, or does not occur, an implant could eventually break due to fatigue. Loads produced by weight bearing and activity levels will dictate the longevity of the implant. Check packaging of sterile products. For product that is provided sterile, do not use if sterile package has been opened or damaged. If sterile package has been opened or damaged, return the implant to Pioneer Surgical. Correct handling of the implant is extremely important. Notches or scratches put in the implant during the course of surgery may also contribute to breakage. Alterations will produce defects in surface finish and internal stresses which may become the focal point for eventual breakage of the implant. Surgical implants must never be re-used. An explanted implant should never be re-implanted. Even though the implant appears undamaged, it may have small defects and internal stress patterns which may lead to early breakage. After implantation of an interbody fusion devices/vertebral body replacements and identification of the presence of fusion, only the supplemental fixation components should be removed. Instruments are subject to damage during use as well as long-term potentially damaging effects such as wear. Damage may result in significant risks to safety and/or inability to function as intended. Use of cervical and lumbar IBFs is contraindicated when there is an active infection at the operative site or with an allergy to polyether ether keytone, titanium, titanium alloy or tantalum; prior fusion at the level(s) to be treated; or any condition not described in the indications for use. Use of the Pioneer Surgical VBRs is contraindicated when there is active systemic infection, infection localized to the site of the proposed implantation, or when the patient has demonstrated allergy or foreign body sensitivity to any of the implant materials. Severe osteoporosis may prevent adequate fixation and thus preclude the use of this or any other orthopedic implant. Conditions that may place excessive stresses on bone and implants, such as severe obesity or degenerative diseases, are relative contraindications. The decision whether to use these implants in such conditions must be made by the physician taking into account the risks versus the benefits to the patient. Use of these implants is relatively contraindicated in patients whose activity, mental capacity, mental illness, alcoholism, drug abuse, occupation, or lifestyle may interfere with their ability to follow postoperative restrictions and who may place undue stresses on the implant(s) during bony healing. These patients may be at a higher risk of implant fatigue, fracture, or dislocation.